THE Durban Progressive Jewish community plays a prominent role in a provincial interfaith council, whose mission is to improve service delivery to the poor. The KwaZulu Natal Inter-Religious Council, launched in October 2007, began when Premier Sbusiso Ndebele invited the province’s religious leaders to join a partnership to redress social ills such as poverty, unemployment, HIV/AIDS, lack of housing, education and clean water, and the high levels of crime and violence. The council brings together eight faiths: Christianity, Judaism, Islam, Hinduism, Buddhism, Bahai, African Traditional and Nazareth Baptists. The Jewish representative on the council is Rabbi Hillel Avidan, chair of the SA Association of Progressive Rabbis. Also active are Paddy Meskin, who heads the council’s Secretariat, and Professor Antony Arkin. Paddy Meskin plays a key role in setting up eight task forces which will do the actual work of the council. The eight task forces are poverty and skills building; moral regeneration; environnment; HIV and AIDS; education; youth; crime and violence; and advocacy and media. More than a hundred religious leaders from different faiths have already signed up to help with the task forces. Training workshops for members of the task forces will commence in the first few months of 2008, as will fund-raising initiatives. The council has enjoyed extensive media coverage in KwaZulu Natal, both print and radio. As a result, a flood of inquiries have come in, including calls from some 300 schools for help with workshops. The council will also forge ties with similar bodies on the African continent. There are some 22 similar inter-faith councils on the continent, under the umbrella of the African Council of Religious Leaders, whose Secretary General, Dr Mustafa Ali, was guest speaker at the KZN launch. All together now. 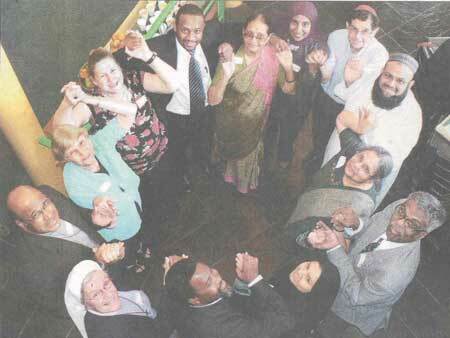 Council members hold hands in a circle at their first meeting after the launch. The chairman, Wilfrid, Cardinal Napier, is at bottom left. The SAUPJ’s Paddy Meskin is two places to his left, and Professor Antony Arkin is at the top right.